Modern birds descended from a group of two-legged dinosaurs known as theropods, whose members include the towering Tyrannosaurus rex and the smaller velociraptors. The theropods most closely related to avians generally weighed between 100 and 500 pounds — giants compared to most modern birds — and they had large snouts, big teeth, and not much between the ears. 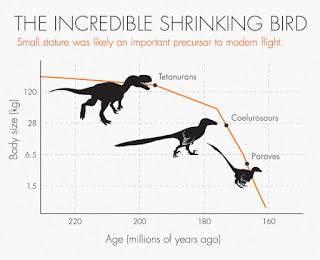 A velociraptor, for example, had a skull like a coyote's and a brain roughly the size of a pigeon's. In the 1990s, an influx of new dinosaur fossils from China revealed a feathery surprise. Though many of these fossils lacked wings, they had a panoply of plumage, from fuzzy bristles to fully articulated quills. The discovery of these new intermediary species, which filled in the spotty fossil record, triggered a change in how paleontologists conceived of the dinosaur-to-bird transition. Feathers, once thought unique to birds, must have evolved in dinosaurs long before birds developed. In modern birds, two bones known as the premaxillary bones fuse to become the beak. That structure is quite distinct from that of dinosaurs, alligators, ancient birds and most other vertebrates, in which these two bones remain separate, shaping the snout. To figure out how that change might have arisen, the researchers mapped out the activity of two genes that are expressed in these bones in a spectrum of animals: alligators, chickens, mice, lizards, turtles and emus, a living species reminiscent of ancient birds..